There’s a social purpose to this project that embodies an idea about bringing awareness to a situation, but also raising money to benefit the people they’re documenting. Architecture has a tendency to be discussed anthropomorphically, and so the fact that they’re using portraits and actually projecting faces onto existing architecture starts to splice known vocabulary with a more socially conscious direction. This work is a documentary project and temporary installation intended to foster an understanding of issues facing Austin’s underserved populations. In partnership with the C.D. Doyle Clinic — a student-run free clinic located less than three blocks west of Waller Creek in downtown Austin — patients will be given an opportunity to anonymously or publicly speak to the issues directly affecting their health and well-being. Throughout the year, a series of interviews and portraits will be compiled in both online and print formats. The resulting collection is featured during Austin’s 4th annual “Creek Show,” encouraging mindfulness, empathy, and respect for the mission of the clinic and those it serves. 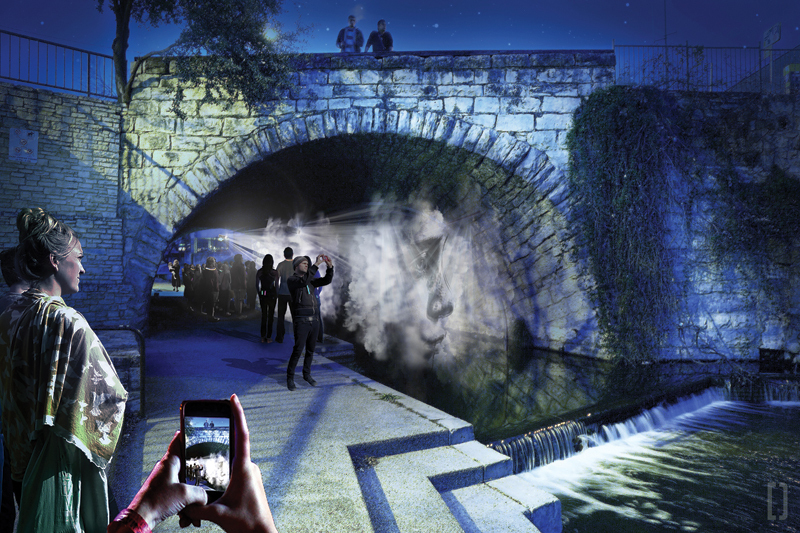 The Creek Show, an outreach of the Waller Creek Conservancy, seeks to bring awareness about the importance and impact of the Waller Creek area of Austin and its transformation to the communities and people of Austin. 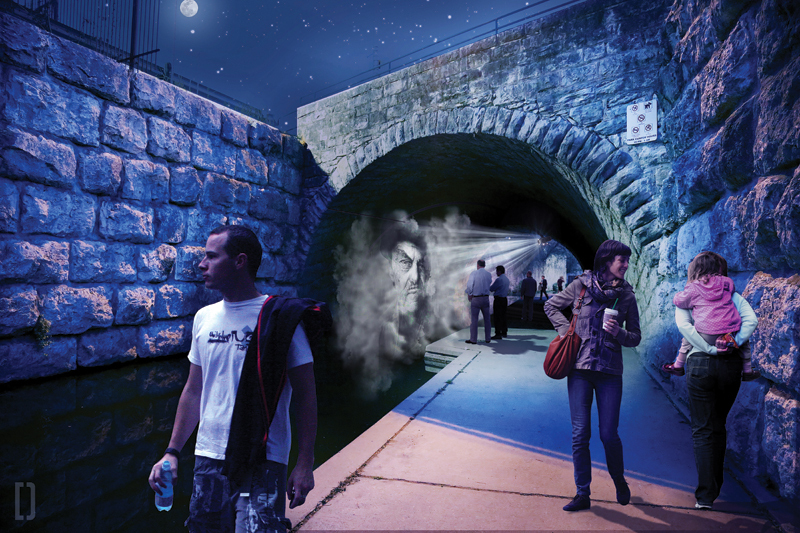 The portraits collected during the year will be projected onto an ephemeral cloud of foggy mist beneath the 7th Street Bridge during the 10-day show. Rolled steel armatures connected by a long section of unistrut pipe will rest on the creek bed, incorporating counterweights for stability but requiring no drilling or ecological disruption. A subsurface pump and filter will channel creek water through flexible tubing running up the armatures and across the unistrut pipe. A commercial-grade misting system will create the billowing fog from nozzles within the pipe. Two battery-powered projectors, mounted from the armature above, supply the imagery that will appear within the mist.